The new science fiction movie that might be a classic in the future. Yesterday me and my brother went to see the new Ridely Scott movie called Prometheus. I was very much looking forward because watching the trailer reminded me very much of this classic movie that I used to love called Aliens. The movie is very much not for the faint of heart, also I am not sure that certain people should go and watch it because of the content that is in the movie. The movie stars Oscar winner Charlize Theron, the new German sensation Michael Fassbender, Swedish sensation that you might recognize from the Girl with the Dragon Tatto Noomi Rapce, Iris Elba, Guy Pearce, and Logan Marshall-Green. this shows that the cast is very diverse and quite good because of the wide movies that they have done over the years. One of the reasons that will make people watch this movie has to be the cast because you will find an actor or actress that you will like or recognize. The movie is set in the future where man has perfected space travel and can travel to any galaxy they desire. the move starts with Noomi Rapace and Loogan Marshall-Green discover some ancient graffiti that hints at that Aliens always existed and that they have been influencing some of the greatest civilizations in the world, leaving hints and clues for us to know about them. They get the coordinates by doing some research and give it to Charlize Theron ship Prometheus to fly them to the planet to search for answers. Using the crew that is of Charlize Theron ship like Michael Fassbender who is very helpful. When they get to the planet they are supposed to all sorts of things happen that you feel like all is not right in this planet. 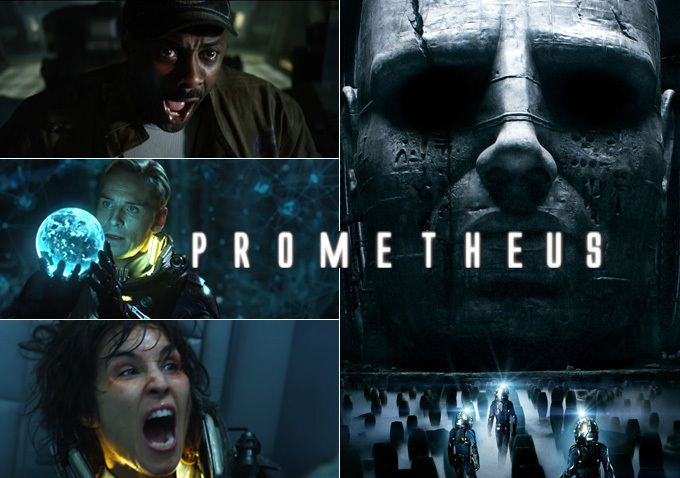 We don’t find out what is happening exactly because of the mysterious nature that Ridelly Scott always likes to do in his films like he did with Aliens, which is another science fiction classic movie.Noomi Rapace is leading the search with her husband with the rest of the crew of Prometheus to find out about how are theses aliens related to our past and how they influenced it and maybe shaped. This where everything goes wrong because you feel that with them discovering our past it will ruin our future because you never want to mass with the past. The movie has unbelievable ending that i cant mention because I don’t want to ruin it but I believe that the ending has more questions than answers but i am sure people will enjoy it. I would say the cast are great, that make the experience of seeing it very good. The story as well is very good and very interesting but not the newest idea but it is still works because of the way it is written. You can watch the movie in both 3rd and regular I would suggest not watching it in 3rd because there is no point of doing that because I felt when I watched it in 3rd that there was no difference or need to pay more to watch it in 3rd. I would very much suggest watching this movie but like I said I am not sure if certain people can see it because it has some scenes that are bit gory, and has very scary scenes that certain people will not appreciate. The movie works well in the genre that it is supposed to be because of the director and the way it was. In the end I would say go watch it I am sure that no one will regret it when you watch it especially to see how it plans out and the ending especially.